The exhibition Europe Through our Objects constituted the central element of the Portuguese EuroVision Lab. Five exemplary objects were re-interpreted from multiple perspectives including a transregional angle and presented in an innovative way that encouraged interaction between the museum and its visitors and emphasized contemporary relevance. This approach was motivated by the intention to challenge and go beyond traditional methods of presentation and to adapt to today’s viewing patterns. The five selected objects constituted the starting point for workshops, as well as for a series of lectures and practical activities. What distinguished the Portuguese EuroVision Lab. was the National Archaeology Museum’s attempt to lend an additional transregional and European perspective to objects that had existed long before before the nation states and the political ‘Europe’ came into being. Crucial to this successful attempt was the museum’s emphasizing commonalities between the ‘Portuguese’ objects and objects from different regions in Europe, but also the highlighting of extensive trade relations and cultural exchanges between these regions. In doing so, visitors were encouraged to ponder the question of a ‘Europe before Europe’ and to reflect on the contemporary relevance of the objects. Based on research on underrepresented visitor groups of the museum that had been conducted prior to the Lab., the National Museum of Archaeology paid special attention to the visitor groups of senior citizens and young families. These visitor groups were taken into account not only with regard to the exhibition concept, but particularly with regard to the extensive accompanying program that revolved around specifically developed workshops (one example is the workshop Europe Piece by Piece: A New Look at the Past for senior citizens). Similar to the project’s other museum partners, the Portuguese EuroVision Lab. 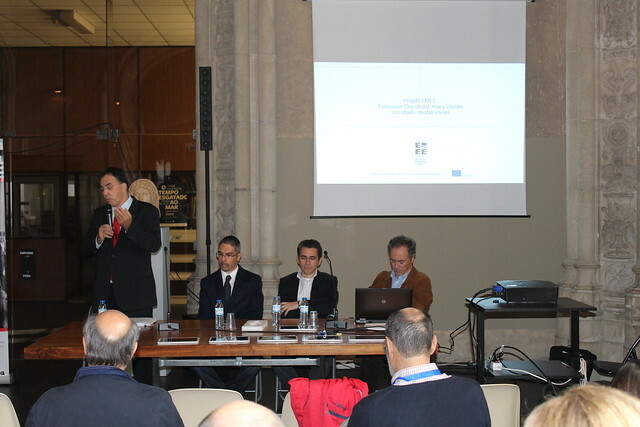 presented the results of the Young Scenographers Contest and the Eurobarometer. The latter was designed to encourage discussion and active participation and also to communicate visitors’ statements from previous Lab. locations to the Portuguese audience. Some elements of the Eurobarometer such as the Zeigerpointer developed by the EMEE partner monochrom, an international art-technology-philosophy group, were also playfully employed as a mode of addressing and engaging visitors during the National Museum Day. Dr. António Carvalho, Director of the National Museum of Archaeology Lisbon and EMEE partner, on the Portuguese EuroVision Lab. Exhibition in the National Museum of Archaeology with some of the objects selected as COP exemplary units, which depict not only the trans-nationality of their use within different European regions. 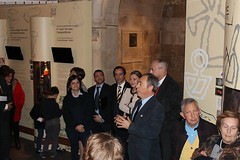 Each object will be highlighted every month with a dedicated public speaking. The exhibition remains open from February 22nd 2016, until May 31st 2016. The awarded works of EMEE – Young Scenographers Contest will be on display in this travelling exhibition which remains open from December 18th 2015, until January 17th 2016. Come to where the objects are! Exploration activities for families, children, and senior visitors of Europe Through our Objects exhibition. A diversified mediation program will be created, which will allow the visitors, particularly the target groups, to reinterpret the objects on display in a European perspective. The activities outputs will be displayed in the Museum and in Social Media platforms. A series of conferences and lectures will be held in the National Museum of Archaeology, in order to amplify the knowledge and stimulate the reinterpretation of the objects, focusing on a European perspective. Warm-Up to the Portuguese EuroVision Lab. : The National Museum of Archeology Lisbon/Portugal started its Lab with the Workshop ‘Social Web and Interaction’ on 26th October 2016 sucessfully. Warm-Up to the Portuguese EuroVision Lab. 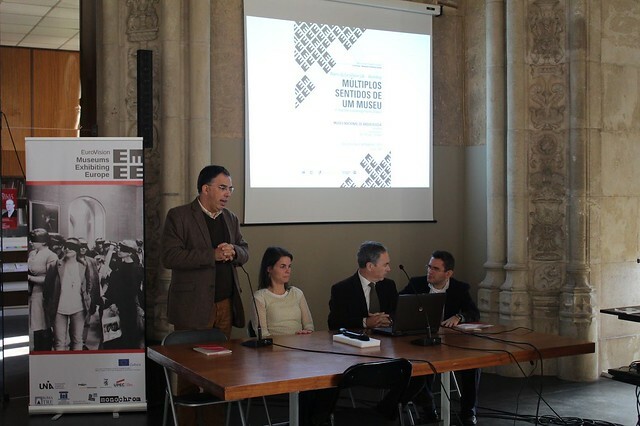 : The National Museum of Archeology Lisbon/Portugal presented its second Lab. workshop ‘Multiple Senses of a Museum – The Importance of Scenography in Museums’ on 9th November 2016.